"First-ever official Denim Delinquent fanzine compendium, the legendary monolithic bastion of proto-punk journalism. Quite possibly the equivalent of the Dead Sea Scrolls of modern punk fanaticism, and one of the rarest self-produced publications to emerge from the pre-DIY years of the early 1970s. Its such a shame how few sets of eyes have seen these primitive pieces in real life, and thats why it was nothing short of prerequisite to forge this book into reality, which will undoubtedly set the clock back a few years on the standard “punk” timeline. We couldnt be happier to see the free-form intertwining of heavy rock, proto-punk, and primitive power pop represented with such unbridled enthusiasm, in a time before it was compartmentalized, commodified, and repackaged for the suburban teen market. 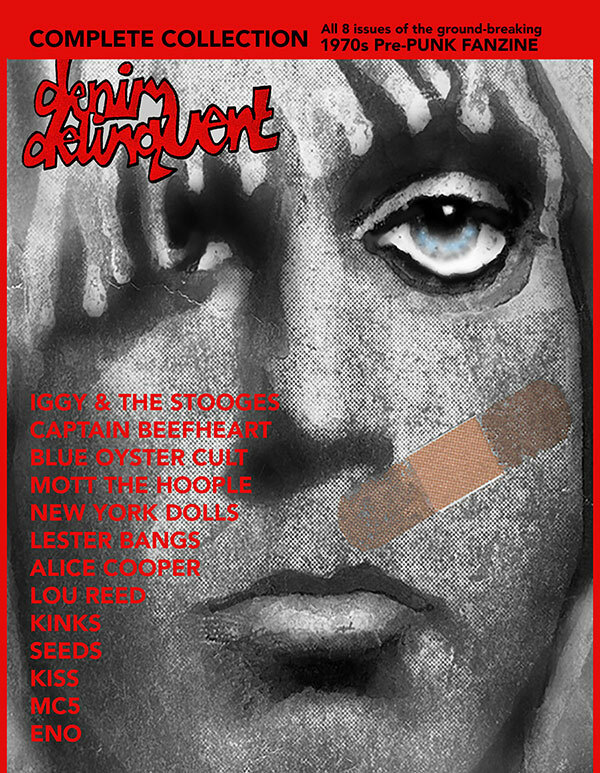 Denim Delinquent is a true gem of unadulterated punk amateurism, condensed into an incredibly hard-edged slice of the early 70s you can immerse yourself in without pretense or punditry, a true pioneer of the underground press culture right at time in rock history where anything was possible, and the open-ended creativity ran wild. As they say, some of the most far ahead-of-its time music came from this early-mid 70s era, and as the rest of the music world sat idly by and waited to be spoon-fed their mellow mediocrity, some real adventurous wild rockers were right there lapping it up as it was happening in real-time, and the founder/editor/publisher Jim Parrett just so happened to fit this profile. Scientists and physicists can keep toiling away at trying to build time machines, but for us, theres no better vehicle for slipping into another time and place than when you are flipping through the pages of underground magazines like Denim Delinquent. The band illustrations are miniature masterpieces, and the writing is highly infectious, as any good fanzine should be- 100% driven by genuine excitement and a bleeding desire to spread the word. Happening across original copies of the magazine would be instant recognition of museum pieces, so were proud to present this North American cultural artifact complete with all of the rough edges intact, and with that irresistible and unmistakable excitement literally bleeding off the edges of each page. 200+ pages. 2nd printing of 300." - Hozac.